When and how did you get into picking mushrooms commercially? I’ve been mushrooming probably since 1988. I had a few friends who were doing it. I heard about it and got some ideas from them. I already had some ideas of where to look because I kind of grew up in the woods, hunting and fishing. I went out and tried it. Originally I looked for chanterelles and picked them almost exclusively with my mother and brother for a couple of years. At that time the job that I had was seasonal, and work was pretty slow in the fall. I had extra time on my hands to make extra money. I didn’t make a lot of money but it helped. The price of chanterelles hasn’t changed much since then. In 1988 I think I was selling them for $4.00 - $4.50 pound. They’re still selling chanterelles at that price. In some years it doesn’t even get that good. I did better then. There was less competition, less pickers, and a little better price. It really was better picking in '88 and '89 than it is now. It’s been almost a year since I was diagnosed with a rare, malignant, invasive breast cancer. Rather than the recommended mastectomy, radiation, and chemotherapy, I decided to opt instead for Eastern and alternative medicine. For the past ten months I have been ingesting Chinese herbs three times a day. My Chinese herbs are made up of at least ten to twenty ingredients, six of which are in the mushroom family. Mushroom therapy is an age-old remedy in China and Japan. The most important is the “mushroom of immortality,” the Lingzhi (or Ling Zhi) mushroom, otherwise known as Reishi (Ganoderma lucidum), identified for over 4,000 years as a medicinal mushroom. You often go mushrooming with a camera and a collection basket. Why is that? I take photographs because I just enjoy taking pictures and sharing with people. As a result of my picture taking, people around me see the things that I see, things that they used to walk right past. They start saying to me: “What’s this? What do you call that? We found one; we found one.” That’s neat, to just share, and that’s what I do with all my photographs: share and educate. And, mushrooms are neat to photograph. You never know what you are going to see on a mushroom. It can be half eaten. You can look underneath it and maybe there’s something crawling. The colors are so vivid. There are so many different mushrooms! Survival. That's why I got into mushrooming. It was a way to enjoy myself when my husband was fishing for trout and steelhead. He'd fish and I'd mushroom. I started off slowly, discovering crested coral, then moved into larger corals and chanterelles, the easy to identify kinds of mushrooms. Within a year I'd found a 16 pound, creamy white cauliflower in prime condition while he was fishing. Now, that caught his eye, and he's been mushrooming with me ever since! Some say that winter is the onset of the flu and cold season, but for me it’s the onset of morel madness. I’m speaking, of course, of the tantalizing spring mushroom known as the morel, universally acclaimed by gourmets. 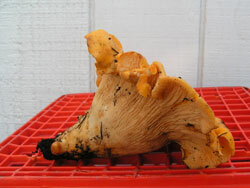 The symptoms start back in November-December when the last of the chanterelles have been served or preserved. 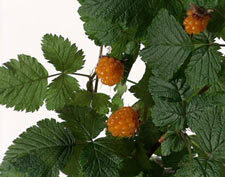 The manifestations persist and mature through the early months of the new year until they peak in early spring. Relief doesn’t arrive until April, May and June. For these are my morel months, months dedicated to sleuthing out these cone-shaped gifts of the forest and fields. Sure, there’s a partial relief from the symptoms of morel madness when the earthy Verpa Bohemica start to fruit. 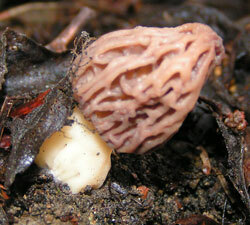 These early false morels, as they are sometimes called, resemble the true morels and tend to grow in similar settings. However, the verpa has a wrinkled, or shallowly pitted, undulating head, and the flesh is typically thin and brittle. In contrast, my morel has a cap honeycombed with ridges and pits attached directly to the stalk, and the fruiting body is substantial. Despite the similarities of these fungi, I long ago gave up hunting the Verpa Bohemica. Although the excursions would give some momentary relief to the morel madness, the combination of newly born, green, wriggling snakes and bristly, stinging nettles that haunt the usual terrain of the verpa soon discouraged me. Besides, I knew if I hung on long enough, just a few more weeks, the morels would fruit, here and there and seemingly everywhere they wanted to. Some could pop up in the newly-laid bark dust in my front yard. Others could follow on the heels of the verpa in the cottonwood stands. Still others could carpet the ravaged lands where there were forest fires last summer. It is in the mountains that I have had my most memorable morel trips. Here the coniferous and hardwood forests and underlying vegetation combine with the majesty of the rugged terrain to offer solace and relief from the ordinary daily life. Here there is a silence from the disquiet of the suburban life. Here there is a natural perfume to contrast the smells of the city I’ve left below at sea level. I come equipped with the tools of the hunt: a wicker basket rests on my arm, a compass and whistle hang around my neck, and my favorite guide book, The New Savory Wild Mushroom, is tucked into my fanny pack to help identify other fungi I might encounter. To you, the casual observer, I must appear to wander somewhat aimlessly, maneuvering back and forth, randomly searching for some sign of fungi. You may even notice that, as I inhale the quiet and the aromas of the earth, a smile creases my face and redefines my mood. Yet, my basket may hold a meager harvest. There is no need to fill my basket to overflowing as quickly as possible; moreling is not about quantity and greed. Greed is not the raison d’entre. Rather, discovery of morels is only part of the day’s pleasure. At day’s end, there will be a bounty of discovery: a new awareness of myself and shared moments with my companion. Perhaps there will also be a handful or two of morels to further quell the madness that’s been building since the chanterelles left last fall. Picking. 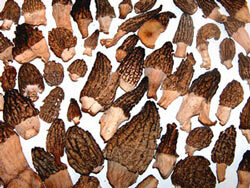 Select only morels in excellent condition. Leave the decaying and insect ridden ones to spread spores for future crops. Choose only perfect morels, free of decay. Cut stems and lay specimens in baskets or in paper bags (never in plastic!). 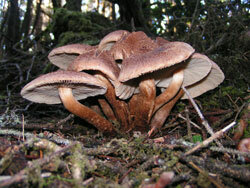 Without good flow of air, the fungi will not stay in their best condition; they need to breathe. Keep cool and refrigerate as soon as possible. gathered as food by local indians. inedible species may resemble edible mushrooms to the uneducated eye. 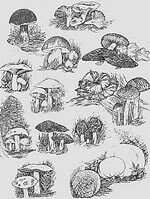 Education and identification are just two of the services offered through mycological societies. Preparation. The debate continues as to whether it’s best to brush or to wash mushrooms. I prefer to quickly wash the morels to remove any clinging debris, shaking them to dislodge both debris and water, and then drying them on paper towels before storing in paper bags in the refrigerator. Remember, like all wild fungi, morels should be cooked thoroughly. Morels, in particular, must never be served raw. 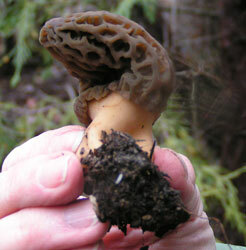 Raw morels contain toxins that will sicken almost everyone. Thorough cooking rids them of these toxins and makes them perfectly safe for almost everybody. Even then, be aware that some individuals seem to have a bad reaction to morels, although the reaction may be due to a combination of morels and alcoholic beverages. So, consume only small quantities and not over consecutive days until you are comfortable with the fungus. Preservation. Drying is perhaps the easiest of techniques, but morels can also be successfully canned or frozen. Dry either in a dehydrator or simply strung on line. Imagine: festoons of drying morels decorating my kitchen! Seal the dried morels in a container marked with the date. Freeze for a week to ensure that any insects that escaped the cleaning and drying process have been killed. Then store the container in a cool, dry place for as long as you can resist the temptation to cook with them. Reconstitute by covering the dried morels with warm water and letting them sit about 20 minutes before using in a recipe. I sometimes think that the true madness of moreling is that there are too few morels and too many exquisite morel recipes. Morels combine ever so nicely with cream in dishes such as this classic and pretty pasta preparation. Melt 1 tablespoon butter in saucepan. Add bresaola and stir gently until hot, about 1 minute. Add morels and cook 1 more minute. Add remaining butter, asparagus and cream. Simmer 10 minutes. Gently fold sauce into pasta. Top with the freshly grated cheese and serve to 2 diners along with salads of wild greens. Arrange thighs, skin side up, on a rack in a roasting pan. Bake uncovered in a 400 degree oven for 45 minutes, or until meat near thigh bone is no longer pink when cut. Place pan in refrigerator until fat has solidified. Remove fat from gelatin and discard. Save gelatin. Remove skin from thighs. Debone meat and chop into small chunks, about 1/4 inch. Combine chopped morels, shallots, celery, eggs, bread cubes, parsley, sage, green peppercorns, chicken broth and reserved gelatin. Add chopped chicken and mix to stuffing consistency. Stuff large morels with this mixture, cutting cap lengthwise as necessary to insert stuffing. Hold together with toothpicks. Melt butter in cast iron pan. Add morels and bake in 350 degree oven for 15 minutes. Turn morels over and cook an additional 15 minutes, or until nicely browned, adding more butter if necessary. Serves 4. The San Francisco Mycological Society offers this tried and true morel recipe which they claim will serve 10 as an appetizer. Evidently, they don’t know how deep the madness runs! Combine the salt, pepper, paprika, sugar, mustard, turmeric, garlic powder, and onion powder with flour. Dip the morels in the buttermilk and roll in the flour mixture. Melt the butter with the oil in a sauté pan or skillet and sauté the morels until crisp and brown on all sides. Blond morel, courtesy of Sue Dawson. Oh, by the way, I’m happy to share these ruminations on and recipes for morels, but, please don’t even consider asking me where I gather them, although I will say that it wasn't here in Curry County. Frankly, you should know that the ultimate madness is to reveal the location of one's morel patches.